Do you see a fallen entity with horns hidden amidst the wings? 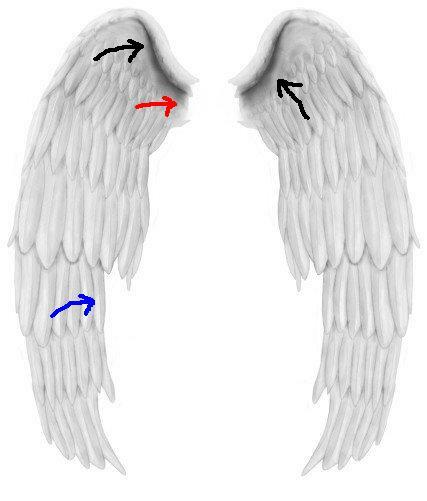 The black arrows point to the horns; the red points to the head; the blue to the knees (as though seated in a yoga position). That figure is more obvious than the wings! Am I paranoid? Absolutely not! As children of God the Father and co-heirs with Christ, we’re called to discern. Such images are inspired by the power of darkness, and they are always disguised to the carnal eye. The yoga position (a.k.a as the lotus position) is extensively used in Hinduism and eastern religions for transcendental meditation, invoking the evil spirits. Also, the Baphomet (Satan) is always portrayed as sitting in the same position. I clearly see a horned creature sitting in a lotus position – and the Spirit in me has affirmed that it’s demonic. 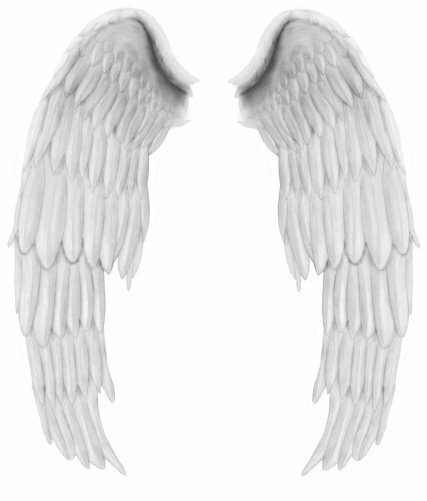 These are NOT wings of God’s angels. Positive verses from the Bible can be from the devil also – Discern! Jesus was obviously hungry being in the wilderness for 40 days. Was it wrong for Him to command the stones to be made into bread? Is it illogical for a hungry man to eat? Satan was not planting an evil thought in Jesus’ mind, it’s a fairly rational thought. However Jesus refuses to heed to the devil just because of one reason: that though he gave a logical solution to Jesus’ need, the words was not of God. To listen to the devil is rebellion against God, regardless of how good the thought is! Satan did not tell Jesus anything lewd, evil, dirty; he saw what Jesus was in need of and offered a solution. How often do we succumb to his suggestions when we are in need? Jesus knew that Satan’s intention was not to satisfy Jesus’ hunger but to get Him to obey him! That was the wicked plan behind the innocent solution. When we plan to get a job, a spouse, a date etc, we run to the Bible or open our ears and eyes to every word we hear/see on TV, books, through friends, preachers et al. Who is influencing our desires and giving a “thumbs up” for us to pursue them? Is it God or the devil? Notice also that Satan knows the Bible like no man does! He knows every reference, passages and incidents recorded in the Holy Book. He used a verse from Psalm 91:12 to combat Jesus when He used the Scripture to fight the devil. God has not prohibited Satan to use His Scriptures! Satan will and does use it to trap God’s children into thinking that the verses and words are from God. Yet Jesus knew his adversary and knew His Father; God would never want Jesus to jump of the temple. If He did, would God not send his angels to save Him? He would! But the very act of testing God and jumping off the temple would have been an act of rebellion. When the devil can dare to use God’s Word against Jesus to accomplish his own agenda, how much more does he do the same with us? People will always say good and encourage us in our dreams – regardless of them knowing better or knowing nothing. During the days of Isaiah and Jeremiah, the Lord had spoken through His prophets the impending downfall of Jerusalem. Yet there were prophets who claimed to be from God yet they prophesied lies of peace. They might have used their logic and thought the wrathful words of the true prophets were too “judgemental”, and that such a good God would never bring destruction upon His own people. If the Word of God does not sound pleasing to you or does not support your vision of the future, do not go around seeking false assurances, even from the Bible. False assurances will be plenty, but warnings few. So discern the source behind your assurances because God does not give a green signal to any human plans.